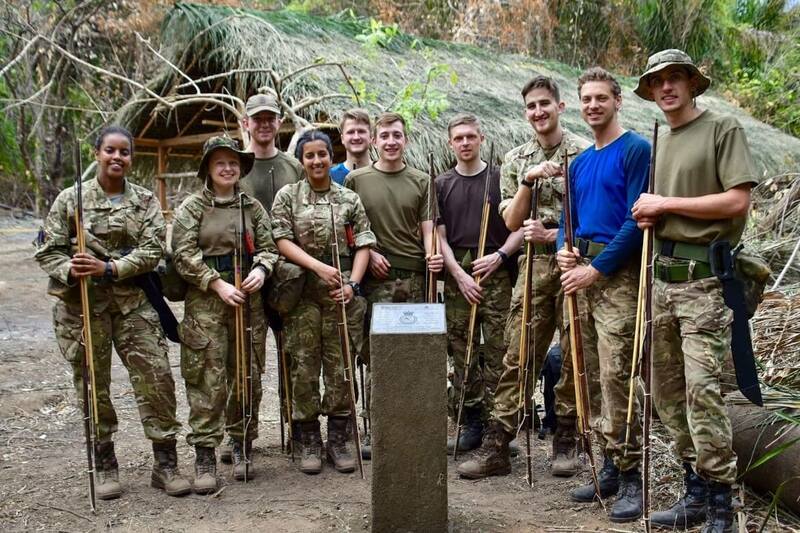 Earlier this year, ten students from East Midlands UAS participated in an adventurous training expedition within the Guyanese jungle. Primarily, the arduous, challenging nature of the activities and environment aimed to develop determination and qualities of self-reliance, confidence, leadership and team ethos in the UAS students, in order to prepare them for potential service careers within the Royal Air Force. In this sense the expedition was a resounding success, each participating member was pushed to their physical limits. Having arrived in Guyana, the expedition enjoyed the luxury of two days acclimatisation in the local indigenous village, Sand Creek. We met with the village council to alleviate some of their concerns around the purpose of our expedition and became acquainted with the detachment of Guyanese Defence Force Special Forces Operatives that the Guyanese government kindly provided for our protection. Our socialising lead to the inaugural EMUAS vs GDF football match in which we emerged as the worthy victors. Reaching our pre-agreed training area required a four-hour trek from the edge of the village into the jungle. Rising at 0300 to avoid walking in the hottest part of the day, the group quickly found their pace and made short work of the march. Each person carried all their personal equipment for the exercise; machetes, hammocks, first aid kits, bashas and more. One girl estimated she was carrying the equivalent of half her body weight. 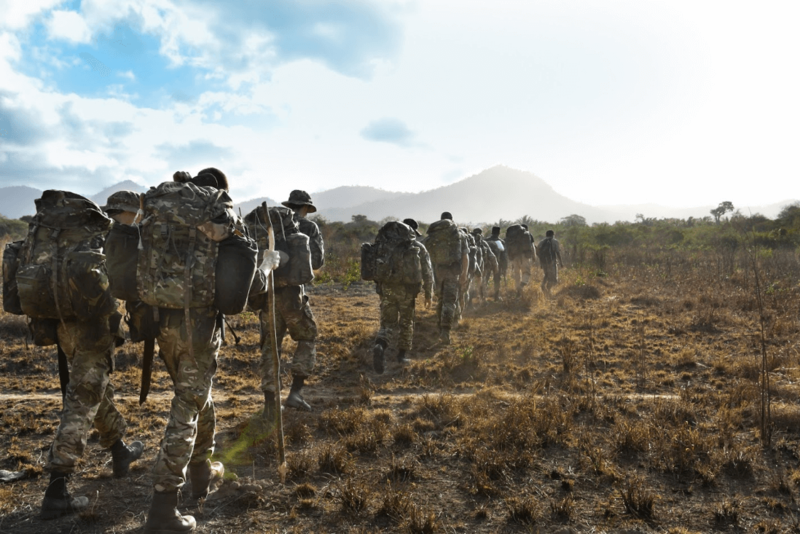 Aside from safely conducting the AT, our secondary objective was to establish a camp within the dense jungle that would be suitable to conduct our adventurous training and jungle safety training from. It was essential that our expedition left a sustainable legacy and so it was decided that once the expedition had been completed, the facilities could be used by the local indigenous village to pioneer tourism and resolve the many socio-economic problems they face. Our training was conducted by local tour company, Untamed Adventures, and indigenous Amerindian guides who applied their expertise and local area knowledge to great effect. 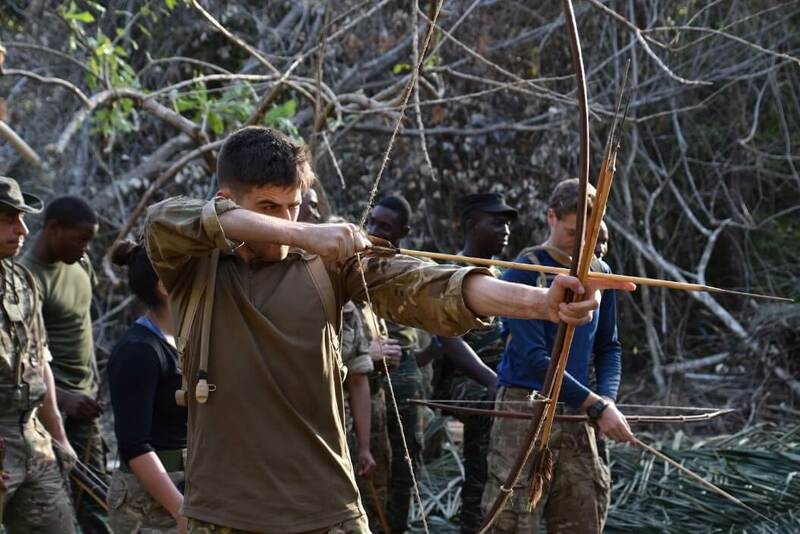 Expedition members learnt the intricacies of living safely within the jungle, enabling us to carry out our adventurous training. Less essential but equally as enjoyable, we had the opportunity to experience indigenous jungle craft and we got to grips with fire lighting and hunting, amongst other things. Our indigenous guides took particular delight in demonstrating the nuances of shooting fish with arrows. 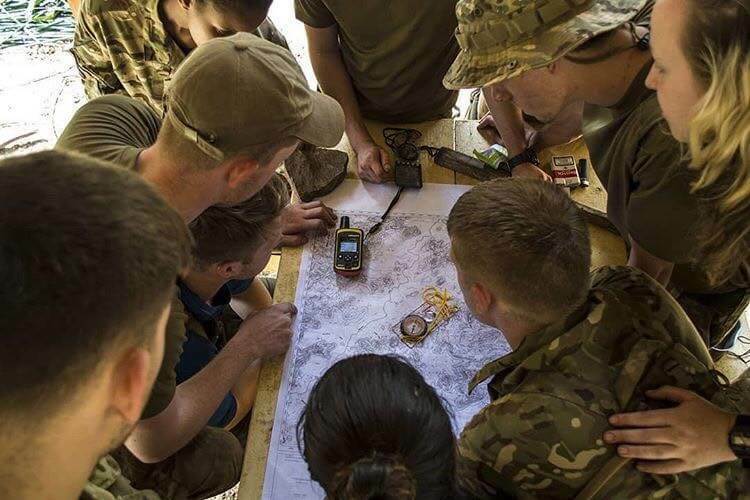 Under their watchful eye, we carried out our adventurous training, eagerly pouring over the limited and often dated local area maps, plotting our navigational exercise. 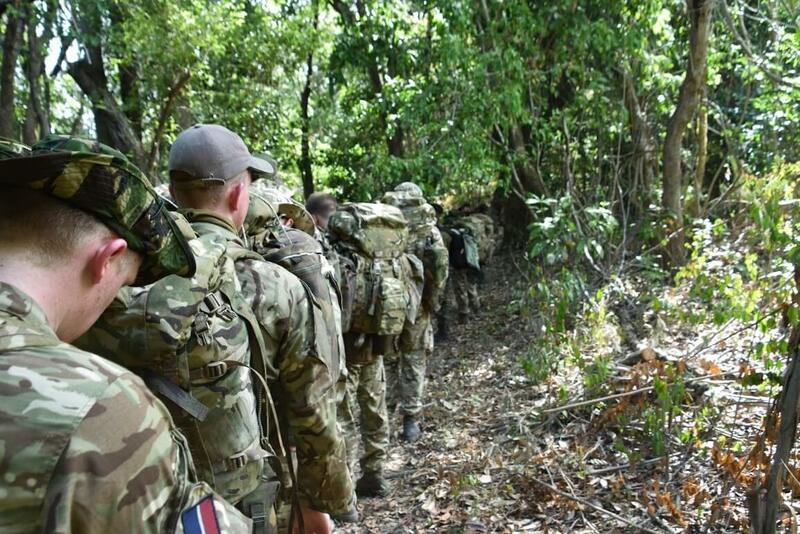 Each expedition member took turns navigating at the front, whilst having to hack through the untouched rainforest, avoiding potentially dangerous flora and fauna. Under the hot canopy and bombarded by biting insects, everyone found it difficult to navigate through the dense jungle accurately. The successful completion of the camp was a testimony to the hard work from all members of the expedition group, toiling away in the hot and humid conditions. Designed by local guides and built entirely from local materials, the camp was a fantastic achievement and the fixing of an inscribed plaque was a fitting conclusion to the project. 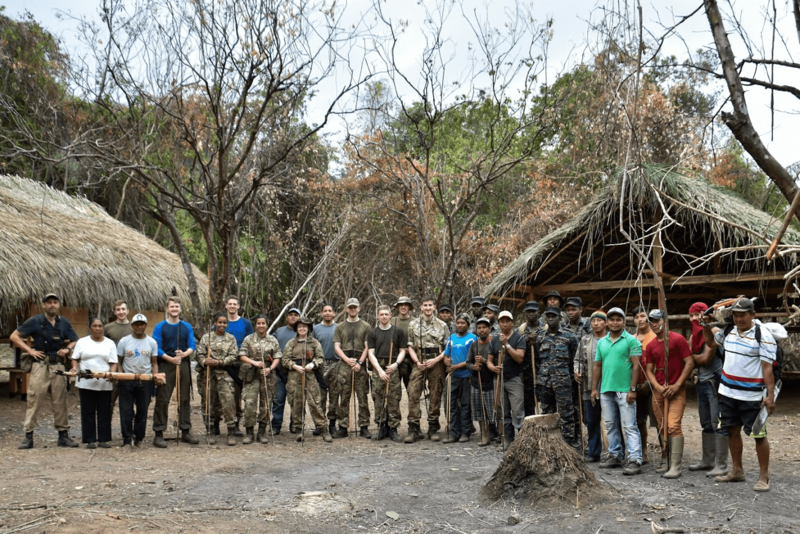 All group members felt immensely proud to have completed the project having worked on almost every single aspect of the build, from the digging of foundations to the breaking of leaves for the thatched roof. 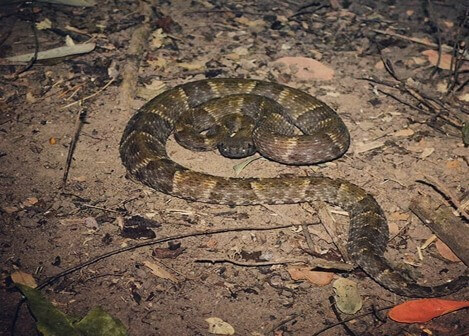 We managed to avoid any dangerous encounters with the resident wild life, bar one particularly frightening encounter between a Fer de Lance and an RAF Rgt Officer; having witnessed the encounter myself I contend that the snake was perhaps the more frightened of the two. Each of the expedition members felt extremely privileged to have had the opportunity to live in the Guyanese rainforest and experience the plethora of flora and fauna. Furthermore, having the opportunity to visit an indigenous settlement and appreciate the challenges that these communities face encouraged us to think as global citizens. In regard to the impact the expedition had on the participants, it goes without saying that each individual got to experience a once in a life time opportunity. First a foremost with its unique nature, each member faced and overcame challenges, some physical such as dealing with the heat and fatigue, but also mental such as getting pas the fear of insects and wildlife. Working hand in hand with villagers and those of the Amerindian culture also meant participants got to appreciate a completely different lifestyle and way of living, allowing us to put in to perspective our own everyday issues in contrast with theirs, and learning from their resourceful and hardworking nature. In relation to the impact it has had on the squadron, it has firstly shown the other students that the sky is limit in to what they can thrive to organise and learn with the right support within a University Air Squadron. It has also reinforced the squadrons high reputation for going above and beyond, both having the opportunity to give, whilst being able to get a lot out of the same opportunity. Seeing the team work together and achieve so much will also work as a message to the other student as to what can be achieved when members come together, creating further ambition. Activities: Canoeing, Trekking, Exploring, Other, Multi.